Dead End From Transformers: Revenge Of The Fallen! 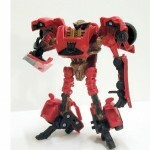 Images of a new Transformer, possibly from the upcoming Revenge of the Fallen toyline have emerged. Featuring a small car alt mode in red, this figure is Dead End! This figure definitely looks more in place in the movie line than in both the Animated, and Universe/Classics line. Could this be one of the new scout figures planned?